You'd think by my fourth pregnancy I would stop googling things and just be able to patiently wait. But, as it turns out, I'm still an indecisive pregnant woman, reading into things, pondering the minutes until baby arrives. I did pretty great til around 38 weeks, if I do say so myself. Then I wondered, every night, if tonight would be the night. It never was, people. It never was. What is it about night time? I've heard many people say that mamas usually go into labor at night, and because I had with all my other children that's when I thought it would happen again. But, I thought wrong. August 7th rolled around, my due date, and baby still was not here. I got up and waddled to the bathroom to pee for the 47th time since the night before. I got my boys ready for their last day of VBS. It was hot and I was ready to have a baby, so emotionally and physically ready to have this baby. Contributing to the excitement was the fact that we didn't know the gender of this little one! This was our first time being surprised and I was so ready to know and hold this precious babe. I fixed the boys some breakfast and, of course, dropped the yogurt I was bringing over to the table. I leaned down to clean up the floor and felt my first contraction in that moment, around 7:45 am. I wondered if it was really a contraction or if I was just cramping from bending over and cleaning the floor at 40 weeks pregnant with a rather large (just wait) baby. I kept quiet and didn't say anything to Caleb, kissed him, and sent him off to work. I didn't want to get anyone's hopes up that the baby was coming, if she really wasn't. I cleaned up, finished breakfast, and continued to have irregular, not intense contractions. I had an appointment with my midwife scheduled for that morning, and decided to keep it, just to be sure I was actually in active labor and to get checked while I was there. My mom came to watch Story and Abram and I told her I thought today was the day. I brought Brody and Foster to VBS and headed to my appointment. I had 3-4 contractions on the way there and knew it was go time. I told the nurse I was in labor when she asked if I was having any braxon hicks and later my midwife told me I was a 3. She encouraged me to not wait around too long as Story's labor was so quick. The contractions were still very manageable as I drove home. I met Caleb there and we sent my mom to the store to pick up a few things she would need for the weekend with the other four kids. I got our stuff together, ate a bagel, and swayed through the contractions. They were close together, around 2 1/2 minutes apart, but I didn't feel like they were that intense for being only that distance apart. Once Caleb realized they were that close together he suggested we get going. El oh el. It's as if he didn't want to deliver a baby in the living room or something. I texted my mom and said maybe you should come now, after telling her to take her time when we sent her off. My how quickly things changed. We got to the birthing center right around noon. 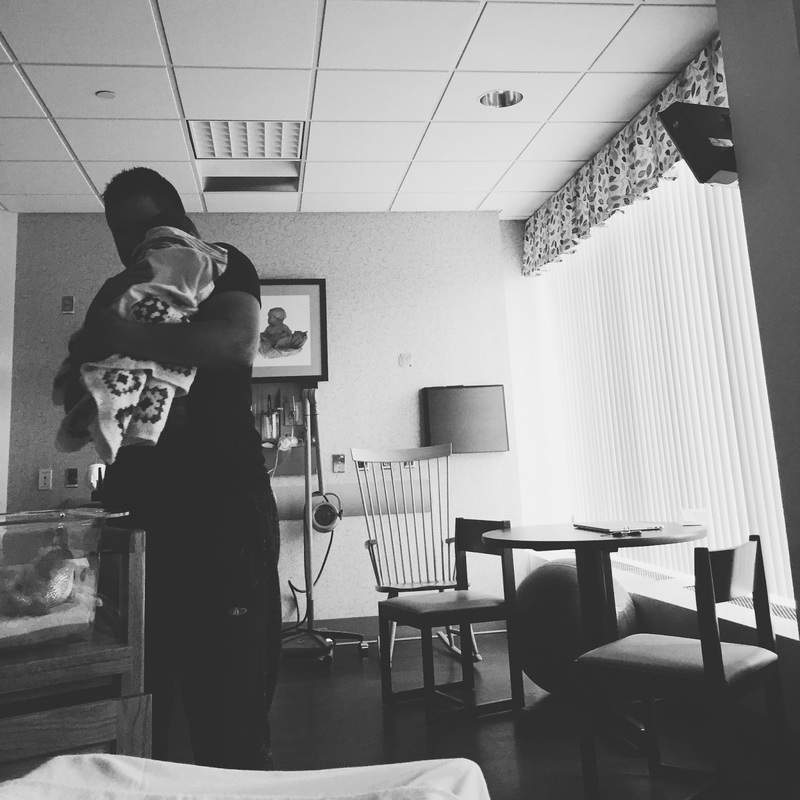 I had a few contractions on the way there and by the time we arrived I was feeling it. The contractions were strong and steady and I had to stop several times on the way up to our floor. I swayed and moaned through them in the parking lot, the elevator, and the hallways. They checked us into triage to make sure I was in labor (was there really any question) and get our room ready. The nurse checked me and I was a 6. 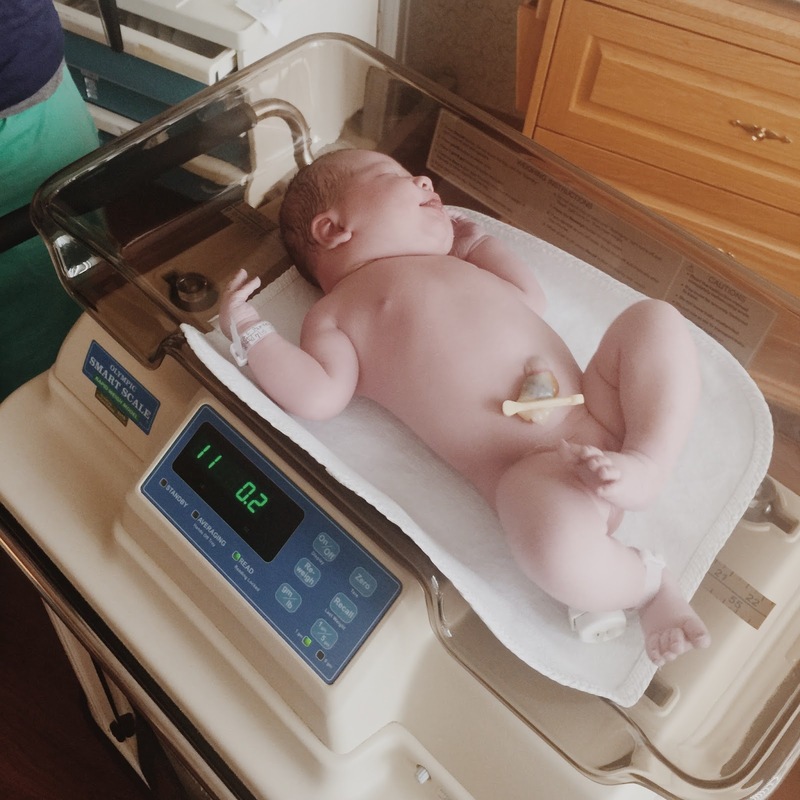 They got the room ready quickly, and after about 30 minutes of laboring the triage room, waving my arms in the air through contractions and listening to Blessed Assurance by Jadon Lavik on repeat, I slowly made my way to our room -- Caleb ahead of me, getting the tub ready. Is there anything as great as slipping into a jetted tub when you're 8 centimeters dilated? The answer is no. I got into that thing as quickly as I could, turning my body to get into the perfect position to make it through each contraction. Caleb kept a cold cloth on my head and Come Thou Fount played in the background. After about 8 contractions in the tub I felt the pressure to push. 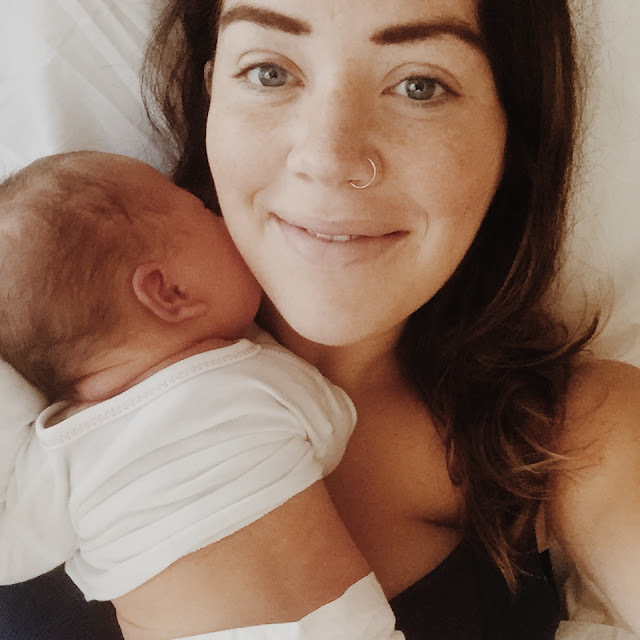 My amazing midwife checked me and told me I was fully. I climbed out the tub, as my water hadn't broke yet, and onto the bed. She broke my water and there was a little bit of meconium, so respiratory came --- just incase they would be needed. I had it in my head that the pushing would be so quick this time around. I pushed two and half hours with Brody, he was 10 lbs 12 oz. I pushed 12 minutes with Foster, he was 10 lbs 7 oz. Story practically fell out of me, with one push, while my midwife ran into the room, and was 9 lbs even. Abram I didn't push at all, his precious birth mom did, and he was smaller at 7 weeks when we brought him home, than any of my other babies at birth. So, if everything continued the way it had, this baby should fall right out, too, right? Little did I know that this would be my biggest baby yet and that she would be posterior. This means that the back of the baby's skull is in the back of my pelvis, and she is face up. My contractions through pushing seemed so spaced out. There was a good amount of time between them which was both good and bad. It gave me time to regroup but pushing felt like a whole different experience this time around. You know the ring of fire which usually lasts the longest ten seconds of your life? The ring of fire felt like it lasted 15 minutes this time. I screamed through each push, oh boy, did I ever scream. I looked at my midwife and was like WHY IS THIS BABY NOT COMING OUT? I had seen my midwife and nurse give each other a look that I was too breathless to inquire about until later. 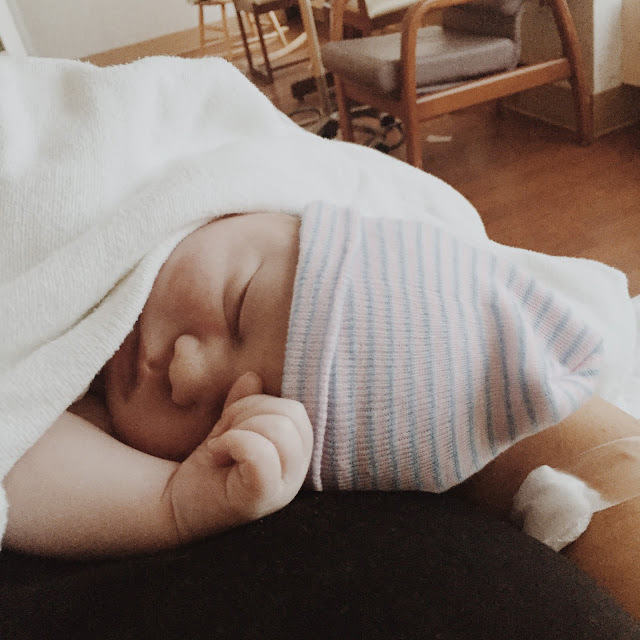 They had thought the baby might have shoulder dystocia due to her position and size. Thankfully, she did not. Finally, after about 35-40 minutes since my first push, around 12-15 pushes, our precious baby entered the world, at 2:50 PM, just two and half hours after arriving at the hospital. Pink, screaming, and no need for respiratory intervention. 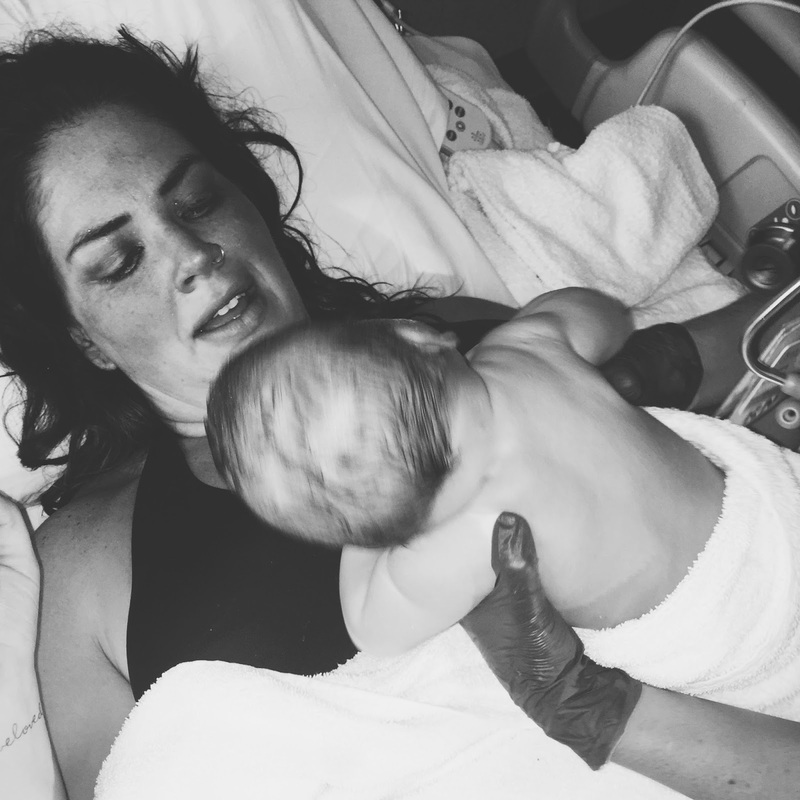 My nurse and midwife cheered and marveled over the length of the umbilical cord and the baby's size. Caleb and I looked at each other and laugh-cried and rejoiced over the gift of this new life, still not knowing if it was a boy or girl. After what seemed like 15 minutes, but probably was only 90 seconds, Caleb was able to see the gender and proudly proclaimed, "It's a sister!" I didn't think twice about him saying sister rather than girl because we were so excited for Story to have a sister. I couldn't believe it. Our daughter was here. We had two daughters. Three sons. Five children. They had each other. The moment I had been waiting for for so long was finally here. After a roller coaster of a pregnancy, our girl was here and was just the way she was supposed to be. Created perfectly in His image. We had three nurses, who I wondered if they were actual people or real angels here on earth? I kept telling them over and over their angel status and how much I loved them. I mean, labor and delivery nurses are a true gift from the Lord above. They hold my leg up in labor, encourage me, change my granny mesh underwear, and stick a new ice pack in them for me. They wipe blood off my legs, wipe sweat off my forehead, change my bed sheets for the 12th time and smile while doing it. I need to get back to the birthing center, as soon as possible, just to hug them one more time. Our one nurse, who was there for the delivery, was chomping at the bit to tell me the baby's weight, before she even knew it herself. 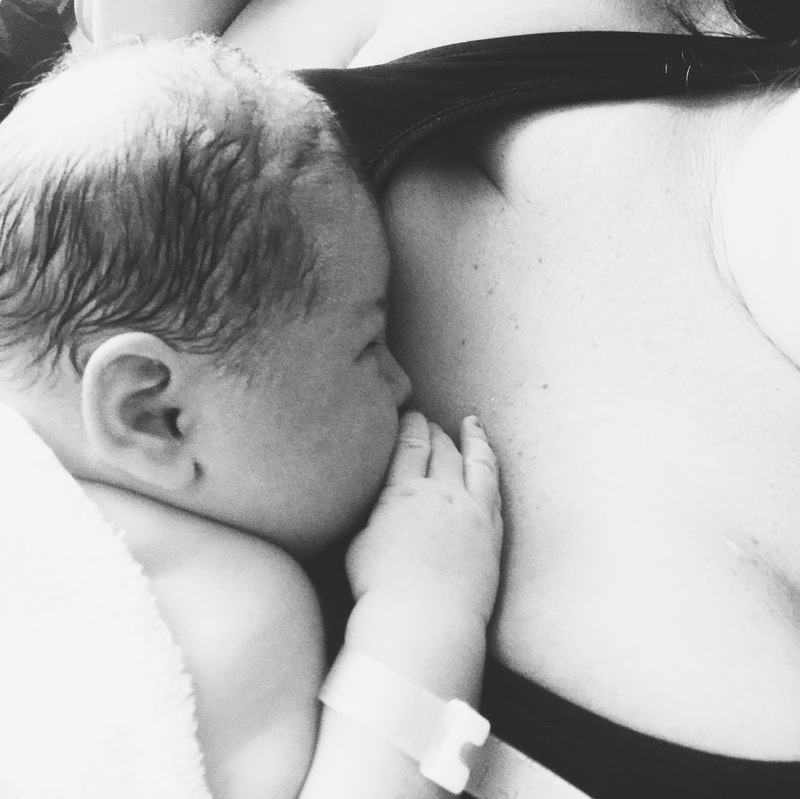 We make big babies, there isn't a truer statement than that, but minutes after giving birth I have no idea if the baby laying on my chest is 8 pounds or 10 pounds. Our nurse rolled the scale over to the foot of my bed and said I want you to see this change from ounces to pounds, are you ready? I laughed and nodded. Thinking in my head, since she was a girl, she would probably be smaller than the boys, like Story was. 11 pounds flashed across the scale and I gasped. Repeatedly. 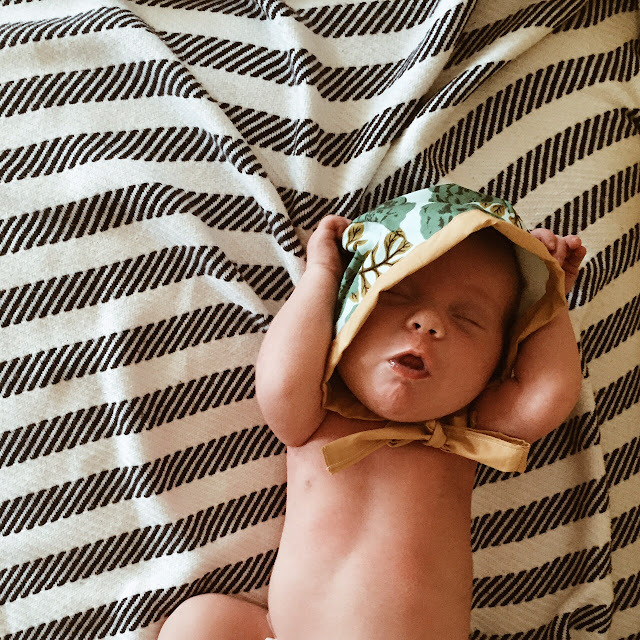 I could not believe that I just pushed that baby out of me, or that she was my biggest yet. We all marveled over the fact that I had no stitches, not a tear, and now, three weeks later, it has been my best recovery yet. What in the world. Thank you, Jesus. We named her, officially, on Saturday the 8th. Texting and calling our family to let them know, Lula Ireland, it was. It couldn't suit her better, and we couldn't love her name more. We spent three blissful days in the birthing center. Sleeping, nursing, crunching on the best ice, and snagging every cranberry juice cup I could. We watched Jeopardy and Wheel of Fortune each night, ate fried chicken, passed Lula back and forth, breathed her in & marveled at her beauty, kissed her soft cheeks, and nicknamed her peach pie. God is so good. We are so thankful Lula was his plan all along, and that we get to call her our own. 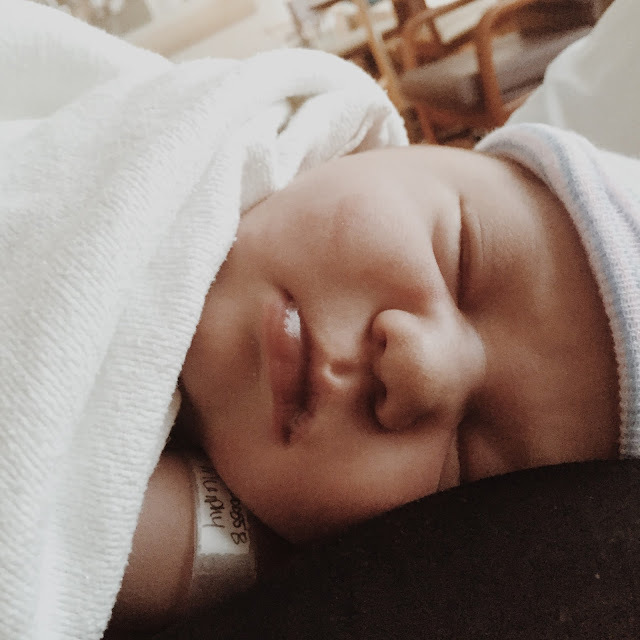 Welcome to this world, baby girl. We can't even remember life without you.